Outer Hebrides. Is this the best place for Short Eared Owl photography? I’ve now been to the Outer Hebrides in spring for the last five years. Originally I thought of running a tour for Corncrake photography boosted with the ‘fill in’ commoner waders like Redshank, Snipe, Lapwing, Dunlin and Oystercatcher. On one trip, several years ago, spring had come really early and the Corncrake had finished – what were we to do? Well the question answered itself. On the first night of the tour we came across some Short Eared Owl chicks (from the vehicle to avoid disturbance) and followed them for a week (from the vehicle) as they were fed and eventually started flying. From that point forward the tour changed and the focus became getting the best Short Eared Owl photographs. By the following year we started keeping count and in one week saw over 120 owls (sightings – not different birds), averaging more than 20 owls per day! We were in owl heaven. Some years the numbers are not as high but most days we see at least five owls and by my reckoning for every 5 you see you get one good photographic opportunity. The key thing is the timing of our visits and searching long and hard for feeding adults. 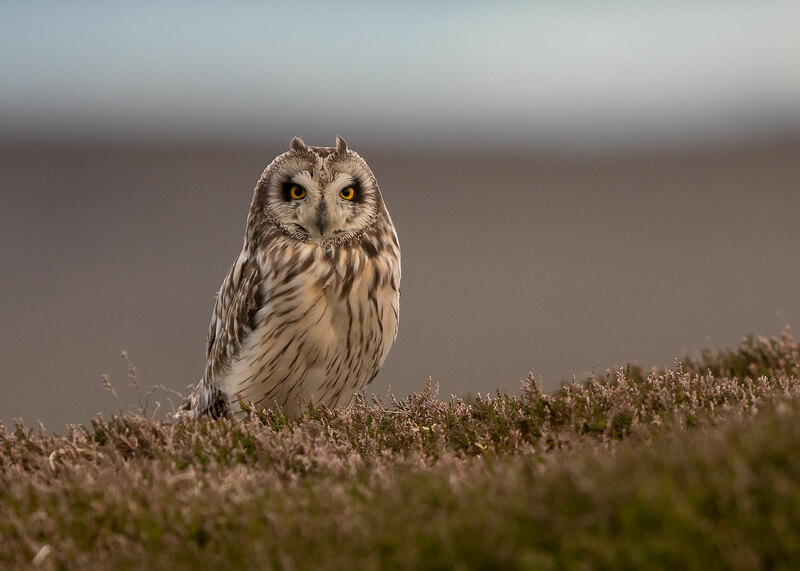 2017 turned out to be a vintage year – the majority of our time spent with a family of Short Eared Owls. Two parents – a pale bird and beautiful rusty bird – feeding four chicks/fledglings in a wonderful environment of moorland heather and cottongrass. So where is the best place to photograph Short Eared Owls? In my opinion the Outer Hebrides takes some beating!